As 2017 draws to a close, I am reminded of two annual traditions that surface at this time of the year. One is the frantic race to complete pressing tasks that I had committed to complete by year end. The second is the opportunity to reflect on the accomplishments, surprises, discoveries, challenges, and laughs over the year. 2017 was my first full year as Executive Director of the WHRI, and I continue to be awestruck with the innovative research led by our close to 200 members. The work you do has led to fundamental discoveries that will improve the lives and well-being of women, and in turn, society at large. After all, as Kofi Annan proudly declared, “When women thrive, all of society benefits, and succeeding generations are given a better start in life.” Over this year I have witnessed new collaborations develop, and established ones flourish. I have witnessed meaningful conversations between diverse stakeholders who care about women’s health research. I have been humbled by the passion exuded by women’s health advocates, locally and globally. 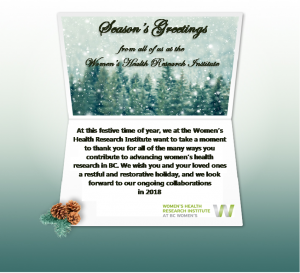 I am immensely proud to be part of an organization dedicated to women’s health research, and I am grateful for our relationship with each of you. I would like to personally wish you and yours a truly wonderful holiday, and hope that you also take the time to reflect and be proud of the role you’ve played.